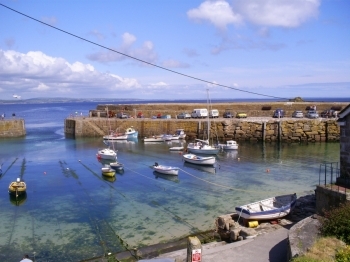 We offer one, two and three bedroom cottages, all within Mousehole and all either on the harbourside or within yards of the harbourside. All of the cottages are available throughout the year for summer or winter holidays and short breaks. Bay View - this property is situated on the harbourside and has stunning harbour and sea views from each of the three bedrooms (one double, one twin and one single)and from the sitting room and the kitchen breakfast room (this room has an open fire). Gurnick Cottage - is approximately 20 yards from the beach and has two bedrooms (one with a double, pine, four poster bed and a second bedroom with two single beds) and a shower room on the first floor and an open plan sitting room (with open fire) and kitchen dining room on the ground floor. Lantern Cottage - is in a private courtyard of cottages and is aprocimately 30 yards from the beach and harbour and has two bedrooms (one double and one bunk bedded room) and a shower room on the first floor and an open plan sitting room/kitchen on the ground floor. Brookland Cottage - has two bedrooms on the first floor. The main bedroom has a double bed and lovely views across the village and out to sea and a second bedroom with two single beds. There is also a shower room on this floor. On the ground floor is a kitchen dining room and a separate sitting room. Treen Lane Cottage - is a delightful one bedroom cottage. On the ground floor is a cosy sitting room with a wood burning fire and a separate kitchen and upstairs is a lovely bedroom and a shower room. There are lovely vieews across the village and out to sea from the bedroom. This cottage also has a private patio with table and chairs. All cottages have flat screen digital tv's, dvd players, hair dryers, etc.